Totally Recalled! is your one stop source for FDA and Consumer Safety recalls, warnings and alerts. Live, breaking health & safety news are featured at the bottom of every page. March 13, 2014 - Dole Fresh Vegetables is voluntarily recalling a limited number of cases of bagged salad. 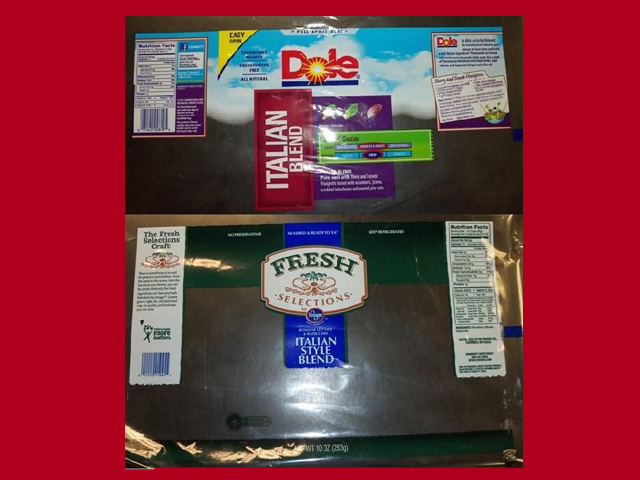 The products being recalled are Dole Italian Blend (UPC 7143000819), Fresh Selections Italian Style Blend (UPC 1111091045), Little Salad Bar Italian Salad (UPC 4149811014) and Marketside Italian Style Salad (UPC 8113102780) coded A058201A or B, with Use-by date of March 12, 2014 due to a possible health risk from Listeria monocytogenes. Dole Fresh Vegetables is coordinating closely with regulatory officials. No illnesses have been reported in association with the recall. The product code and Use-by date are in the upper right-hand corner of the package; the UPC code is on the back of the package, below the barcode. The salads were distributed in 15 U.S. states (Connecticut, Florida, Illinois, Indiana, Kentucky, Maryland, Massachusetts, Michigan, New Jersey, New York, North Carolina, Ohio, Pennsylvania, South Carolina, Virginia) and 3 Canadian provinces (New Brunswick, Ontario & Quebec). No illnesses have been reported in association with the recall. This precautionary recall notification is being issued due one sample of Dole Italian salad which yielded a positive result for Listeria monocytogenes in a random sample test conducted by the Canadian Food Inspection Agency. Although product is 1 day past its Use-By date and it is highly unlikely that any product is still available at retail, retailers should check their inventories and store shelves to confirm that none of the product is mistakenly present or available for purchase by consumers or in warehouse inventories. Dole Fresh Vegetables customer service representatives are already contacting retailers and are in the process of confirming that the recalled product is being removed from the stream of commerce. No other salads are included in the recall. Only the specific Product Codes, UPC codes and March 12, 2014 Use-by date identified above are included in the recall. Consumers who have any remaining product with these Product Codes should not consume it, but rather discard it. Retailers and consumers with questions may call the Dole Food Company Consumer Response Center at (800) 356-3111, which is open 8:00 am to 3:00 pm (PT) Monday - Friday. Connect with Maria Blanco on Google+ Some people might call me a health nut, and probably I am--but not in the typical sense. I am concerned with good food, quality nutrition and a healthy environment just like everyone else. But I am just as concerned about the things that everyone takes for granted: Things like our medicines being safe to consume. Things like the instuments used by my surgeon being safe and reliable. And things like the toys my children and grandchildren play with not being toxic or outright deadly. It takes time and research to discover how to best protect yourself as a consumer. And because of this, I write Totally Recalled so that people everywhere will have a one-stop place to find all of the newest recall and safety information on all products--ranging from everyday lettuce to medical blood plasma. Maria Blanco, CFH is a Health and Wellness writer specializing in Nutrition and Natural Remedies. Picture Window theme. Powered by Blogger.